Our Easter weekend trip was amazing. We returned to Vancouver with a bag full of books, some thrift scores, a new bike and enough good times to last until next year, at least. Not only did we explore nature and gawk at waterfall after waterfall, there also was some noisy 2am Fred Meyer foraging for left over Easter chocolates after a night of trivia and deliciously hoppy I.P.A. at the Basement Pub. Naturally, there was much good eating to be had. Amazing breakfasts at Gravy & Junior’s, Kyla’s delicious blueberry waffles and some collaborative macaroni & cheese with the skinniest & delicious-ist asparagus ever. But my most favorite meal in Portland? Easy. My PABST sandwich and the Hedge House salad with beets, hazelnuts, blue cheese, greens, and a balsamic dressing that Kyla and I shared at the Hedge House. To die for, seriously. Today I rode my new-to-me (I bought it used off Craigslist for a steal) Trek 520 to the local bike shop and while it was busy getting tuned up, I snuck off to the local food co-op with a crazy idea in my head. Yes, I was going to tackle the PABST sandwich for tonight’s dinner. If I was feeling super ambitious, I would have also made the beet n’ blue cheese salad as a nice accompaniment, but I figured some cheddar-beer Kettle Chips would have to suffice. Hell, these chips are Oregon made! The results? Did this sandwich live up to expectations? Damn, straight! 1. Fry up turkey or veggie bacon according to package directions until crisp. Meanwhile, in a small bowl mix up a couple blobs of mayo along with a bit of crushed garlic. Slice up tomatoes and avocados and cheese. 2. Toast bread and spread with butter. Spread a thin layer of dijon on one side of the bread, and spread some garlicy mayo on the other side. 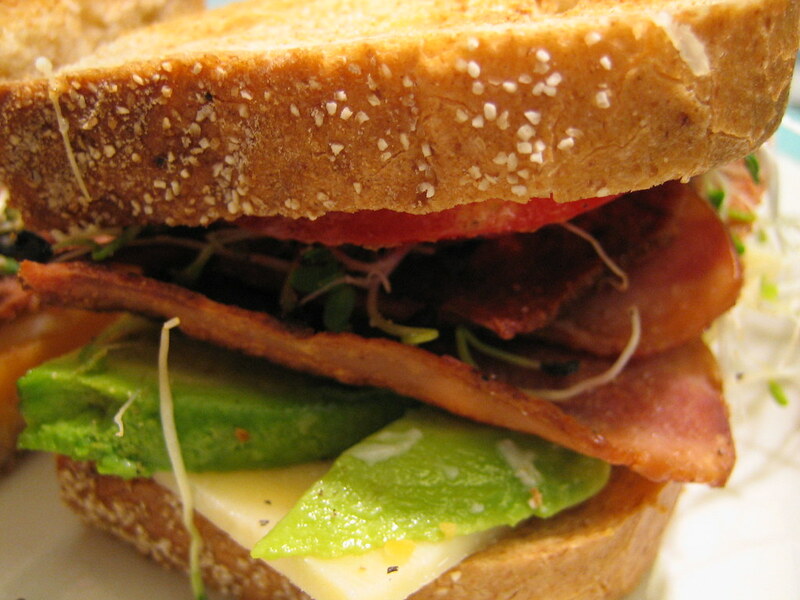 Add a thin layer of cheese to one side of the bread, and cover with avocado and then the bacon. On the other side, add one layer of tomatoes and sprinkle with salt & pepper. Add the sprouts and press the two sides together making one tasty, tasty sandwich. That looks like a great sandwich! Contrary to your blog’s title, I don’t particuarly like sandwiches. rachel, i don’t even go nuts over sandwiches! i got the name from a vintage kids cookbook that i love. but this sandwich is definitely a converter! Actually Dawna, these are garlic sprouts but I’m sure mixed bean or sunflower sprouts would go great! I’m also not a fan of the alphafa, so any sprout substitution would get my okay! oh I am so jealous of your weekend in the NW!! Tania, I’m happy to report that Pabst beer was nowhere in sight while eating this sandwich. Instead, we drank really hoppy strong IPA. Yum! Rorie, it’s a great sandwich! I made a GABST last night, since we only had goat cheese in the fridge. It was really tasty, but really rich. I wouldn’t recommend goat cheese for this sandwich. However, with that being said, my hubby and I loved everything else about it! We used veggie bacon, cruncy sprout mix from a local farm, homemade sandwich bread (recipe on my blog), and grape tomatoes. Thanks for the recipe and recommendation! And here I am wondering how the hell one crams a bottle of beer between two slices of bread! This take sounds much more plausible, and more tasty, to boot. ooh, i like the sound of a GABST, Tanya! Nice work! I can’t remember what search led me to your blog, but when I saw the PABST sandwich recipe, I copied it down right away. Tonight, I finally made it, and oh my god, it rocked my world. Thanks so much for sharing it!